Technology and humanity have always had somewhat of a strained relationship. While one was designed to make the other’s existence a little bit easier, science fiction media, ardent conspiracy theorists, and stressed out entrepreneurs have driven a wedge between the two, frequently insisting that technology is undeniably bound to turn on us. Whether it’s the robots of Skynet or Elon Musk rambling about the murderous tendencies of artificial intelligence, fear of the tech-fueled apocalypse is as old as people sound when they insist it’s going to happen. And now, they have a new poster child. In the last few weeks, a cute, yellow, robotic dog has gone viral for its unbelievable, unimaginable, and unmatched ability to open a door. 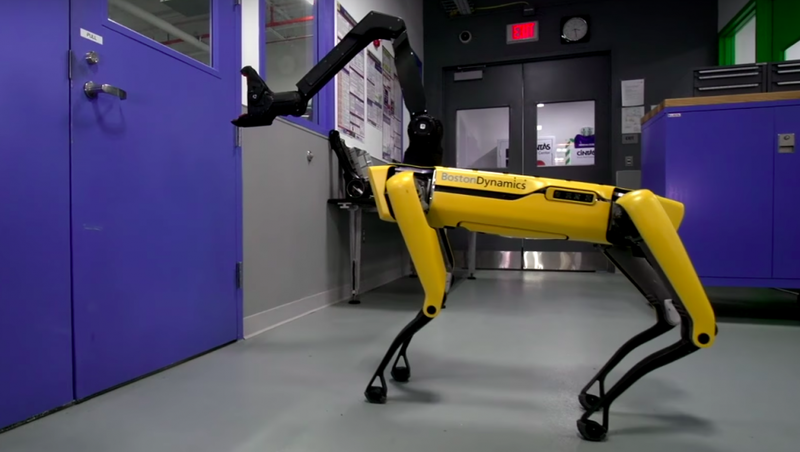 With its sleek body, creepy joints, and noticeably strained movements, the four-legged (and one-armed) robot dog struts into the frame of the video, walks up to a door, and opens it with the speed and precision of a drunk toddler learning to walk. The innovation from Boston Dynamics, dubbed SpotMini, is admittedly quite impressive. While robotic technology has improved enough to give us everything from backflips to beer runs, interacting with something as complicated as a door is a notable step up for our mechanical counterparts. Although, it is worth noting that humans don’t exactly open doors that way. But that’s not all! In a new video released just a few days ago, Boston Dynamics upped the ante by attempting to hinder SpotMini from opening the door. Armed with nothing more than a hockey stick and a well-placed piece of ribbon, which are hardly sufficient tools for fending off the impending apocalypse, one engineer did his best to stop the robotic dog from accomplishing its mission to no avail. The new development has taken the worrisome masses to the next level of technophobia, instilling fear in pretty much anyone that has ever watched an episode of Black Mirror with the lights off. Social media has blown up with apprehensive posts, Boston Dynamics has been inundated with questions, and even reputable reporters have begun spinning a web of dystopian clichés for the sake of a few extra clicks. I’ll be the first to admit that joking about robots taking over the world because they know how to open a door is objectively hilarious. The key word, though, is “joking.” This isn’t Jurassic Park. If you actually think that doors are our last line of defense in the allegedly unavoidable war against our artificially intelligent colleagues, you can rest easy knowing that a locked door would’ve stopped SpotMini in its tracks. A robot replicating human behavior is no more a sign of the apocalypse than that showering rat is a sign of a future dominated by small, furry overlords. There’s no denying that technology is scary. Even the most decorated of experts are rightfully mystified and mortified by technology’s meteoric rise in the last few years. The seemingly endless supply of potential could lead to a wide range of innovations that we can’t even imagine yet. Technology isn’t scary because it might bring upon the end of the world. Technology is scary because, for the first time in a long time, the trajectory of its evolution is unpredictable. But as long as you aren’t a pessimist of the most dramatic variety, that’s a good thing.